Built for large format printing, the HP Designjet T1200 PostScript is a 44-inch printer that promises speedy printing of drafts, plans, and drawings. With HP's signature engineering and technology, the device aims to become a cost-effective addition to a small business that deals with graphics and design layouts. However, the Designjet T1200 PostScript is large, heavy, and it needs a better network interface. This device is integrated with the HP thermal inkjet technology with the company's signature colour layering technology to produce high-resolution images at up to 2400x1200dpi. The HP T1200 PostScript inkjet printer requires 6 inks that are pigment and dye-based, and can accommodate a maximum of 300 feet of rolls. Standard connectivity options on the HP Designjet T1200 PostScript include 1000Base-T Ethernet and high-speed USB 2.0, but there is an additional slot for an EIO Jetdirect accessory. This sheet-fed printer measures 41.3 inches tall and 28.4 inches deep. 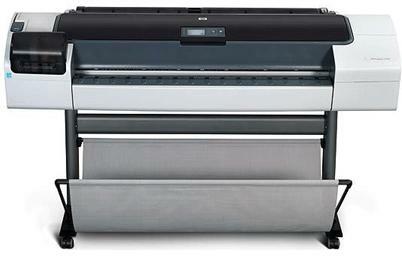 The HP Designjet T1200 PostScript is fast enough to print D/A1-sized sheets in 30 seconds. It can be shared over a medium-sized network that needs quality GIS/CAD printouts. Users can feed two online roll sheets measuring up to 44-66 inches wide. The dye-based inks used by the HP Designjet T1200 PostScript version printer means more accurate and vibrant output especially in colour jobs. Some users find it difficult to configure the HP Designjet T-1200 PostScript's network settings. The large footprint means the HP Designjet T1200 PostScript requires more room lengthwise (69.7 inches wide), but there is limited mobility because it weighs approximately 85.72kg. The T1200 PostScript colour printer does not come with USB and Ethernet cables.